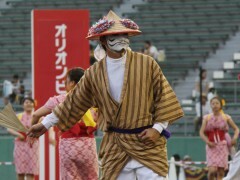 Chondara is a comical character who is a part of every summer Eisa performance. The chondara are clowns with a face usually painted white with black lines emphasizing the funny character, and they are very seldom female. Each Eisa group has its own chondara, who often come in pairs. Their job is very important because they make audience laugh and get people to dance. They jump, twirl and whistle during the Eisa performance, and during a break, they serve water, wipe sweat, and assist the Eisa dancers as they need. After the performance is over, they serve drinks from their awamori jug. Usually, people who have been a part of an Eisa group a long time become Chondara because they know every detail of the performance.